“Want to go see Santa Claus?” I ask my 3-year-old granddaughter Ainsley as we wait for her parents and uncle to ride Twilight Tower of Terror at Disney’s Hollywood Studios. She enthusiastically agrees this is a great idea, so we queue up with other preschoolers this balmy December day to meet the jolly old elf. 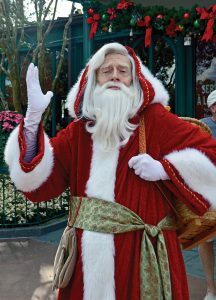 You might not think of Santa Claus as a Walt Disney World character, but he is if you are visiting in December. 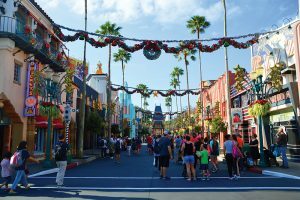 You also may not know one of the best times to visit the land of Mickey Mouse are the first three weeks of December when crowds are smaller, and all the fanfare of the holidays is on full display. Of all the parks, Disney’s Hollywood Studios is the most festive. It’s 1930s-era streets are decorated in period finery making a visit here nostalgic and fun. We arrive early in the day and opt to go back to the hotel in the afternoon to rest and for Ainsley to take a nap. For this park, it works well because two of its most popular holiday attractions take place in the evening. Sunset Seasons Greetings are projections of Disney Characters – Mickey Mouse, Minnie Mouse, Olaf and others – sharing their favorite seasonal stories as holiday magic transforms the famous Hollywood Tower Hotel into scenes of the season. Jingle Bell, Jingle BAM! is another over-the-top show combining state-of-the-art projections, fireworks, special effects and music. In December, with the sun setting earlier, you can take in the nighttime fun without being out too late for the little ones. New for 2018 is Toy Story Land which features special seasonal fun, such as holiday songs on Alien Swirling Saucers. As soon as we walk through the tunnel under the railway station, a giant Christmas tree comes into view. As we walk along Main Street toward Cinderella Castle, I notice all the shop window displays feature Disney characters in different holiday scenes. Overhead are old-fashioned silver bells and wreaths all along the street. Other than the beauty of Main Street, there are few holiday reminders unless you attend Mickey’s Very Merry Christmas Party, a specially ticketed, limited-attendance celebration that takes place on select nights. Make sure and check the schedule whether you are attending or not. The days the party takes place, the park closes early. If you do attend the party, there is an exclusive showing of Holiday Wishes fireworks and performances of Mickey’s Once Upon a Christmastime Parade, A Totally Tomorrowland Christmas and Mickey’s Most Merriest Celebration stage show with all the characters dressed in their festive finery. Frozen characters Anna and Elsa, along with mountain man Kristoff and snowman Olaf also present a musical performance. 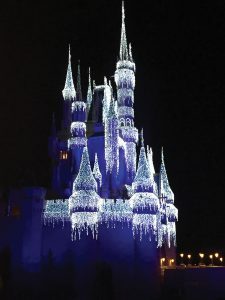 The seasonal show finishes when Queen Elsa presents a gift to everyone in the kingdom by transforming Cinderella Castle into a sparkling, icy centerpiece for the celebration. Epcot does a great job of bringing the holidays to its visitors. With subtle hints in Future World like vegetable wreaths decorating The Land, to the international extravaganza in World Showcase, the park is a wonderful place to find the holidays. A massive Christmas tree divides the two worlds. We pass flower beds filled with poinsettias, meet Père Noël in France and sample as few delectable sweets at special Holiday Kitchens. A fun activity for older children is Chip and Dale’s Christmas Tree Spree scavenger hunt. After purchasing a map and stickers from select merchandise locations, participants travel around World Showcase looking for the famous chipmunks with their ornaments. Once the map is completed, guests can return their completed maps for a festive surprise. One of the most popular Epcot traditions is the Candlelight Processional. This retelling of the Christmas story features a celebrity narrator accompanied by a 50-piece orchestra and a choir. Performances are presented three times each night throughout the holiday season. And the nightly fireworks display, IllumiNations: Reflections of Earth, features an additional holiday finale. 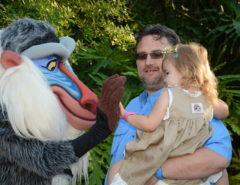 Of all the parks, Disney’s Animal Kingdom is the least celebratory of the parks. Only a Christmas tree is present shortly after entering the park. But, new this year, is a welcome holiday touch with the inclusion of Diwali, the holiday Festival of Lights in India. Disney Springs, on the other hand, is alive with festivities. The free Disney attraction offers holiday shopping, dining and entertainment. The Christmas Tree Trail is lined with custom-decorated holiday trees, each dedicated to a popular Disney theme featuring characters like Mary Poppins, Mickey Mouse, Minnie Mouse and many others. At Santa’s Chalet, Santa Claus is on hand and, from December 25 through 31, Santa Goofy will take over after Old Saint Nick heads back to the North Pole. We visited Disney Springs and all four parks in the span of six days including flight time. 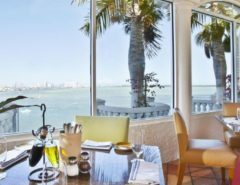 If possible, try to add a day or two to relax and visit the many resorts. 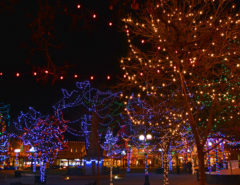 Each has its own holiday flare and special exhibits including a life-sized gingerbread house, impressive decorations and themed holiday merchandise. For more information about visiting during the holiday season: www.DisneyWorld.com/Holidays. 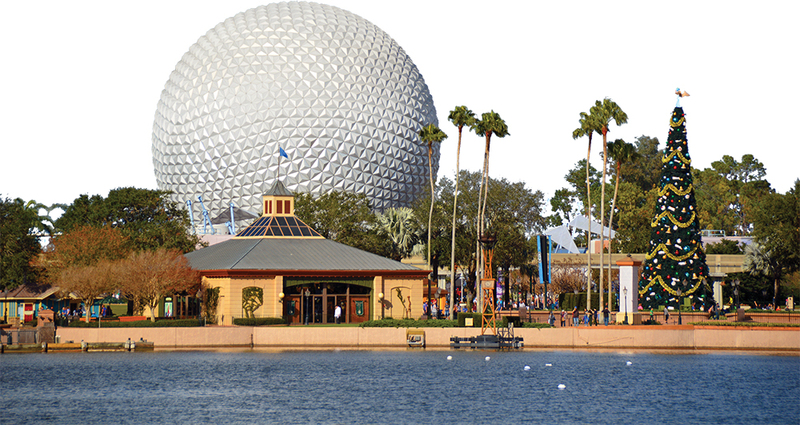 For more Walt Disney World information click here.